A few weekends ago I gave a talk at the KU Diversity Summit, an online conference that took place virtually, but also physically at the Kansas University School of Journalism in Lawrence Kansas. As you know, I have a soft spot for Kansas. As you may or may not know, I usually don’t do online conferences because I have a hard time dealing with the technical and social snafus that usually accompany them. I like to give talks, not be told I have to install Windows-only software or register for a site with sketchy privacy policies just to interact with listeners. I know other people can deal with this stuff gracefully and I happily recommend them when I’m saying “Thanks but no thanks” to people. I may be getting a little cranky in my old age, but I’m also just interested in giving higher quality talks less frequently. This is a goal for 2012. Anyhow, the team from KU charmed me and assured me the tech issues would be minimal; I could do everything over Skype, have slides or not have slides and they’d field questions from the live audience and from Twitter. It went well. They had a tight schedule so asked me if ten minutes was okay. I said “Fifteen?” As it was I managed to do it in about twelve. The full video, all five hours of the conference, is available online here, but I’ve trimmed out the part that I did, short talk, short Q&A session afterwards and links to more information are at librarian.net/talks/ku. It think it’s a pretty concise summary of the major digital divide issues that I think are facing people and libraries. I just saw a pair of great talks by Nadine Kozak, whose work you should check out. She did her PhD work on the literal last mile, conducting ethnographic field work in two rural communities, one in Alberta, Canada, and the other in central Wyoming. I was surprised to find out how many people still have *party line telephones* in 2011, in the US. 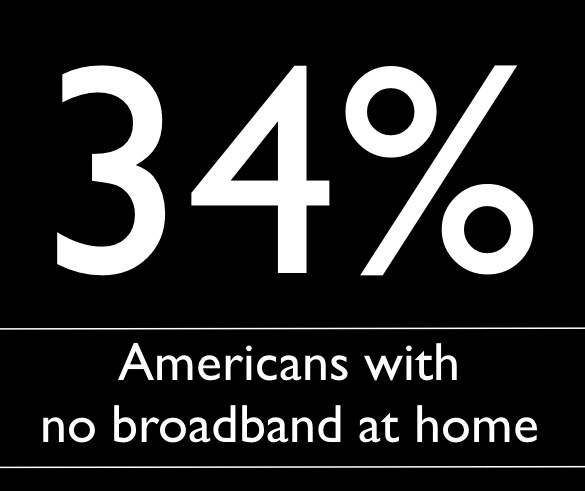 Much less reliable Internet access, or broadband.